Microsoft – WAZIRay – my life. It’s a global issue among all Azure Blockchain users since the documentation isn’t mature. Microsoft documentation on the Blockchain API is insufficient and misses a lot of important points, since the Azure Blockchain service is still in preview such things are expected in documentation. We were facing this issue then my Colleague Khaled Salameh managed to resolve it with below mentioned steps. Thank you Khaled, you make the life easy for Azure Blockchain workbench developers. The end result should help you finish writing your code in a way that should work. There are several things you need to modify on your Blockchain configuration on Azure, Blockchain API requires OAuth2 Tokens to function, that’s why the Swagger UI couldn’t connect to the API and returned 401, because the Swagger UI that comes with blockchain out of the box doesn’t support OAuth2 and the API Key that is supposed to be filled there won’t work with Blockchain API because OAuth2 is a must. To sum it up, the #blockchain API requires #OAuth2 authentication token, this token isn’t passed using Swagger UI or the application you built, you need to modify your application to authenticate to AAD OAuth2 to obtain a Token from AzureAD, then you need to use this generated token in the request header to the API in order to call the API. One additional tip, don’t select the default machine size while creating workbench, but choose better performance machines like: VM Size: Standard F2s_v2 (2 vcpus, 4 GB memory) ==> approx.. 50 USD per month . In my previous post we compared Azure & Azure Stack. Today we will compare Windows Azure Pack & Azure Stack. Windows Azure Pack is another product offered by Microsoft, to provide cloud services for data center that delivers cloud services for end users and customers but its limited to private cloud only. Both Azure Stack & Windows Azure Pack (WAP) have some similarities however they also have significant differences that we will discuss in this blog post. What is WAP ? It was first introduced in 2012 with the launch of Windows Server 2012 at no extra cost. It is based on SQL Server, Windows Server & Microsoft System Center suite, offering customers Self Services, multi tenant Cloud services (SaaS & PaaS) such as Virtual Machines, Websites & Databases. Some of the key features of WAP is listed below. Tenant Portal To provision and manage services such as Virtual machines & Websites by Tenants. Admin Portal For services administrators to manage resources that they made available for tenants. They can configure quotas or User accounts. Service Management API REST API provides the ability to extend functions to tenants and admins such as creating users , managing subscriptions etc.. Virtual Machine Cloud Services IaaS services of WAP provides the ability to provision Windows and Linux machines. Dependent on Ms System Center components (Service Provider Foundation & Virtual Machine Manager VMM). WAP Web Sites Provide the ability to provision scalable web applications based on ASP.NET, PHP & Node.js. Service Bus Distributed applications can communicate reliably using messaging services. Automation Automate tasks in WAP using System Center Services Management Automation. International Language Support WAP Supports following languages: English, German, Spanish, French, Italian, Japanese, Chinese, Brazilian, Portuguese, Korean & Russian. Complete features of WAP can be found here. WAP utilizes Windows Server & System Center for its infrastructure to deliver the services. WAP now supports Windows Server 2016 & System Center 2016. POC of WAP can be done by installing Express Edition of WAP on single VM or Physical Machine however for production minimum of 8 machines are needed (VM or Physical). System Center Dependency Highly dependent on System center components to provide features such as VM Automation, and usage data. Virtual Machine Manager, Operations manager, Service Provider Foundation & Service Management Automation are Specifically needed. No dependency on System Center for mentioned features however some of them are not available to date. Hybrid Cloud with Azure WAP is based on completely different API set which cannot be used with Azure. Azure Stack & Azure uses same API sets therefore applications and services can be moved back & forth using same templates. Azure Resource Manager Not available in WAP, therefore if you already knows Azure templates, you still need to learn how to work with WAP. Azure Stack uses ARM templates, therefore same deployment templates can be used in interchangeably in both Azure & Azure Stack. Flexibility Primarily a private cloud solution. WAP offers features such as Shielded VMs and third party management tools for partner products which are currently not available in Azure Stack. Azure Stack is true hybrid cloud solution providing flexibility of hosting & moving apps / services between on-prem to the public cloud (Azure). a policy to a newly created virtual machine by a tenant. Not available at this moment. deploy each tier separately, and then configure integration between them as a separate task. Using ARM & ARM Templates, it is possible to define sequence & deployment of different roles like Back end SQL , Middle Tier Application Server & Front end web servers making deployments faster and less error prone. System center integration WAP uses System center components like SCVMM, SCOM etc.. When VM is provisioned through WAP, it is actually handed over to SCVMM. This simplifies the rest of VM management tasks. Azure Stack does not integrate with System center. WAP offers cloud services your end users and customers in a private cloud environment whereas Azure Stack does same but additionally provides integration with Azure thus creating a true Hybrid cloud environment. Since Azure Stack is a new product comparing to WAP, but Microsoft is working to expand its features over time including the features which currently available in Azure only. Windows Azure Pack running on Windows Server 2012 R2 will be moving into extended support on July 11th 2017, and Windows Azure Pack running on Windows Server 2016 will moving into extended support on January 11th 2022. For a complete list of currently available services, software development kits (SDKs)/tools, and architecture in Microsoft Azure visit the following website. AzureStack can be thought of as Azure for the data center. Just like Azure, AzureStack features are also evolving day by day. Most key features of AzureStack are same as of Azure and some are additional to AzureStack. Compute AzureStack allows to provision VMs of different types & sizes using AzureStack Portal and ability to connect them to a Virtual Network. Storage Storage Account includes Table, Blobs, Ques & Files. deploy an application including all its dependencies (like Compute, Network, Storage, Active Directory, SQL, SharePoint etc…) in a single operation. You also can redeploy templates to update an application or service when required.To view and download the Azure Stack Resource Manager templates from GitHub, go to the following website.You can deploy templates by using the Azure Stack Portals, Windows PowerShell, Microsoft Visual Studio, or the Azure Command Line Interface (CLI). This is a repository where tenants (DevOps) can obtain preconfigured resources (based on ARM Templates) to consume (like Services & Applications) made available by Cloud Operator. Stack have the relevant software installed for an organizations compliance rules. In addition to Compute, Network, Storage Resource Providers, AzureStack also offers other providers like SQL Database & MySQL and many others to provide these databases as services. There is no billing system included in AzureStack however usage data (which is recorded and aggregated) can be exported to BI tools such as Microsoft Power BI for creating charge back reports. This is Azure App Service (Azure Websites and Azure Mobile Services) which is ported on AzureStack. You can use this service to create cloud applications for both web and mobile clients. For further information about the key features and capabilities of Azure Stack, visit the following website. This could be tricky however knowing the key features of both Azure & AzureStack would help you in deciding (along with other factors) where to port your application. Azure is hosted in Microsoft data centers thus all the head-ache of managing underlying is shifted to Microsoft whereas AzureStack is hosted in your data center so it becomes your responsibility to keep it updated by all aspects. Azure has lot more features that are currently not available in newly launched AzureStack but this will be changed with the passage of time. Moreover, the update cycle for both Azure and Azure Stack is much more frequent compared to other Microsoft applications. Therefore, new features and capabilities will be included on a more regular basis. • Cost: The cost of hosting Azure Stack in your datacenter as opposed to subscribing to the services offered in Azure. • Time: The administrative overhead of managing and updating the Azure Stack infrastructure. • Other factors: There may be any number of other factors that will affect your decision that relate specifically to your organization such as security, compliance, or latency. In many cases, you might need to utilize both products to provide a true hybrid cloud platform as described earlier in this module. This model provides you the capability to offer specialized solutions hosted in your datacenter and the ability to utilize the Microsoft public cloud including all its benefits as discussed. So choose wisely but this is guaranteed that a true Hybrid Cloud environment can be achieved together with Azure & AzureStack if architected in a right way. Next Read: Choosing between AzureStack & Windows Azure Pack (WAP). If you are already using Microsoft Azure in any way, you may be aware of two roles (personas) which exist and two more introduced in Azure Stack which also exist “behind the scenes” in Microsoft Azure. Azure Stack is offering four personas, each persona has a defined set of responsibilities. One of more persons could be assigned to each persona and similarly one person may be assigned to more than one persona as per Organization needs. Cloud Architect is responsible for carefully planning & architecture how the leverage Azure Stack in the organization. He may also responsible for creating different offerings as per Organization needs. This role requires to be an authoritative in order to drive cloud adoption in the organization. Cloud architects are heavily involved in the planning and deployment stages of Azure Stack through communication with OEM vendors and technical delivery partners. Cloud Architect is also responsible for creating (Hybrid) Cloud Strategy in his/her organization. Comparing to Current Azure Portal, this role is currently behind the scenes, may be fulfilled by Microsoft Guru’s like Mark Russonovich , Scott Gurthie , Corey Senders and may be more. Cloud Administrator is same like Azure Subscription Owner, therefore this persona is also called Azure Stack Subscription owner. It is the responsibility of the cloud administrators to manage their Azure Stack subscription(s), determine who has access to a subscription(s), and the actions that each user could undertake in any of their subscription(s). DevOps would be the consumer of Azure Stack resources within the context of tenant. They are responsible for deployment and configuration of Azure Stack resources within assigned subscription with their functions limited by Azure Stack Cloud Administrators. multiple tenants, while isolating the resources that the tenants consume from other tenant resources. You can use the CLI to manage Azure Stack on Windows, Linux, and Mac operating systems. Azure Stack is currently available through Enterprise Agreement only, however You may also try Azure Stack for free by downloading the Azure Stack Development Kit (ASDK). • Provides application developers the ability to be more productive. Using Azure Resource Manager and templates, you can quickly deploy applications in a consistent manner. • You can use the knowledge and experience you gained with using Azure when managing and consuming Azure Stack. • Service Providers adopting Azure Stack can provide cloud services across the globe. • IT organizations can provide cloud services on demand. Review Introduction to AzureStack here. 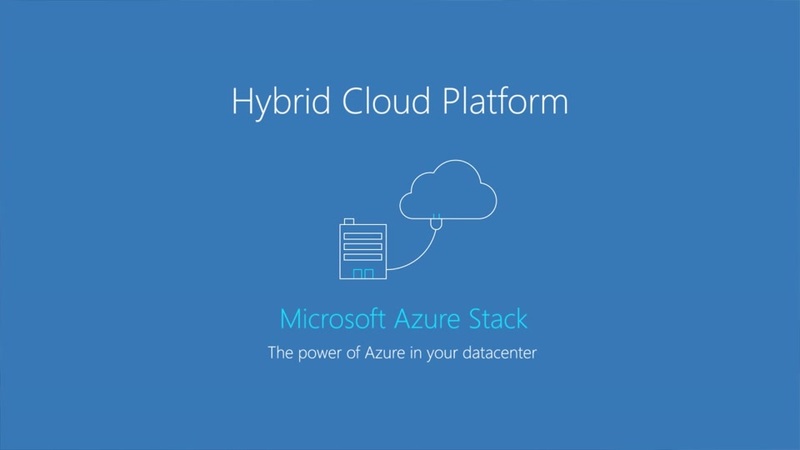 Microsoft Azure Stack is a hybrid cloud platform that lets you provide Azure services from your data-center. Microsoft is describing Azure Stack as “an extension of Azure.” After the initial purchase of Azure Stack, customers will only pay for Azure services that they use from general availability, forward (“pay-as-you-use” pricing). The current one-node offering meant for dev/test will continue to be free after general availability. Azure Stack comes in the form an appliance built to run on specific server hardware like HPE, Dell EMC, Lenovo, Cisco & recently Avanade and Huawei. It provides customers with many of the pieces of Microsoft’s Azure public-cloud platform in a form they can run inside their own or partners’ on-premises datacenters. It can be thought of Azure in your data center. It provides same look & feel as Azure Portal. Scale-able to fulfil the needs of any sized organization. Shipped with ARM (Azure Resource Manager) to quickly deploy & configure Virtual Machines or Applications. Offers PaaS & IaaS to build SaaS applications. Before you plan to use Azure Stack, let’s discuss some key concepts of Azure Stack. If you are already using Azure then below concepts are not new to you except Personas. Additionally you will be allowed to prepare your own plans & offers according to available resources in our data center and type of technology stacks your organization is operating. • Cloud Architect: Responsible for the design of the cloud from a strategical perspective to ensure it meets the needs of the business. • Cloud Operator: Responsible for managing the day-to-day operations of Azure Stack such as responding to alerts and managing the underlying infrastructure. • Cloud Administrator: Responsible for the tenant subscriptions in the cloud including who can access them and the actions that can be performed on the subscriptions. • DevOps: Responsible for managing the deployment and configuration of resources consumed in Azure Stack from a tenant perspective. Portals Azure Stack includes two portals: one for cloud operators to manage and maintain the Azure Stack environment and another for cloud administrators and DevOps to manage and maintain the Azure Stack resources that they have consumed through subscriptions. Regions Regions provide Azure Stack the ability to scale beyond a single location. You can create multiple regions and offer different services in each region. In other words, these could be your data center locations. Services Services are Azure Stack’s key features. Services such as web services, virtual machines, and Microsoft SQL Server databases are provided to tenants in the form of plans. Plans You use plans to group one or more services. Tenants subscribe to Offers made from one or more plans, which then allow tenants to use the services provided each plan. Offers You use offers to group one or more plans. cloud operators present plans to tenants who can then subscribe to them. Cloud operators can create add-on plans to increase a tenant’s quota of resources. Subscriptions Subscriptions contain the offers that tenants subscribe to or purchase. Azure Resource Manager Azure Resource Manager is the interface that you use to deploy, monitor, and manage solutions created in Azure Stack. Resource Group A resource group is a logical collection of resources such as virtual machines, IP addresses, storage virtual networks, or websites. Templates You use Azure Resource Manager templates to define the deployment and configuration of an application offered to tenants in Azure Stack. available in Azure Stack including Compute, Network, and Storage. Blob Storage Blob storage provides the ability to access and retrieve large amounts of data such as documents, media files, or virtual hard disk (VHD) files for virtual machines. Table Storage You use table storage to store data that you need to filter or select based on criteria such as user data or address book information. Role Based Access Control (RBAC) You use RBAC to control access to Azure Stack resources and services. RBAC controls access by using role definitions associated with the users who log in to Azure Stack. Usage Data Azure Stack collects usage data to provide charge back and billing reports or to help integrate Azure Stack with external tools. Azure Stack Packaging and Pricing Datasheet can be downloaded from here.